Angela Meyer’s writing has been widely published, including in Best Australian Stories, Island, The Big Issue, The Australian, The Lifted Brow and Killings . She has previously published a book of flash fiction, Captives (Inkerman & Blunt). She has worked in bookstores, as a book reviewer, in a whisky bar, and for the past few years has published a range of Australian authors for Echo Publishing, including award-winners and an international number one bestseller. She grew up in Northern NSW and lives in Melbourne. 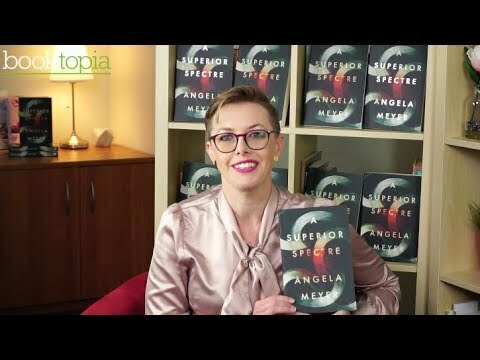 A Superior Spectre is her debut novel. An interesting concept, if delivered a little slowly. I was a little disappointed with this book, hoping for something that would explore more of the science fiction part of this scifi/personal drama crossover. The author seems to spend too much time introducing the premise, and not enough time exploring it in depth, and then it seems to finish before it's resolved. I would really like to have seen this concept more fully explored. Nevertheless, it's a good read. Sensitive readers may want to note there are a few fairly graphic sexual references but these are short - skip the paragraph and you're all good. I've never read a story like it, and absolutely loved every moment. Thank you Ms Meyer!! Meyer writes with an almost scary understanding of the human psyche, with A Superior Spectre sewing together the relationship between personal desire, conformity, and social taboos. The underlying genius of this novel is its connection between the past and the future, forcing the reader to consider their own place in time. By no means is this book hard work, but requires you to disrobe and dive into the story with your full attention. It is mature, unpretentious, and unapologetic. It is a wonderful novel, and I'm very much looking forward to my second reading.